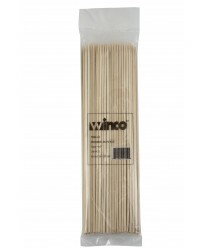 Great for buffet-style or tabletop service, the Winco WSK-10 Bamboo Skewers, 10", (100/Bag) are made of all-natural, renewable material. The skewers are smooth and rounded and they taper to a sharp point that pierces meat, poultry, vegetables and fruit easily. At 10 inches long, these eco-friendly bamboo skewers offer ample room for stacking, so they are perfect for larger kabobs.